by Peter Harriman | photos by Greg LatzaLearning the science, building the plant and finding a way to sell the products, the Broins truly did start from scratch. by Janna Farley photos by Greg Latza and Ashley TempletonJack Myers of POET Biorefining – Corning is dealt a blow which forces him to reassess his priorities. 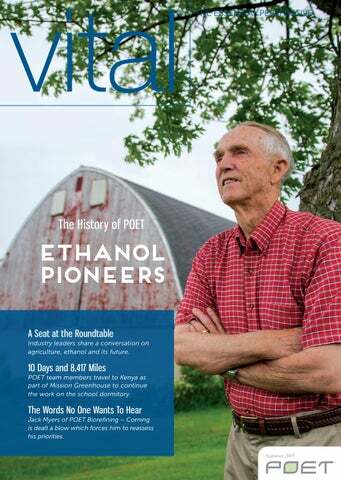 A Seat at the RoundtableIn early June, Vital brought together leaders from the ethanol and agriculture industries to discuss the state of each industry, the challenges each industry is facing and how we can determine a successful path forward. Here is what they had to say. From the Heartland: Get Screwed! Mission Greenhouse: 10 Days & 8,417 MilesPOET team members travel to Kenya as part of Mission Greenhouse to continue the work on the school dormitory.